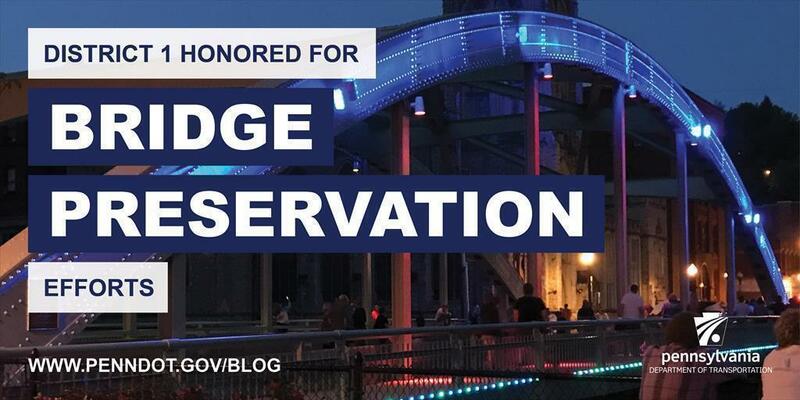 District 1's efforts to rehabilitate the Center Street Bridge​ in Oil City, Venango County, have been recognized with an Oil Heritage Region Historic Preservation Award. "The project was a great opportunity for PennDOT to work with the community in order to preserve one of its historic landmarks," said Mike Deibert, assistant district executive for construction in District 1. "This project ensures that the unique structure will be safer and accessible for all motorists as a gateway to the city's downtown." Mike Deibert, assistant district executive of construction for PennDOT District 1, accepts the Historic Preservation Award from Kathy Baily, Oil City Main Street program manager. Diebert represented PennDOT in accepting the preservation award during a ceremony held in Titusville in May. The Oil Heritage Region Historic Preservation Award, presented by the Oil Region Alliance of Business, Industry and Tourism, recognizes individuals and organizations who undertook rehabilitation and restoration efforts involving buildings or other structures in the Oil Region that are at least 50 years old. Recipients are selected from among nominations received from the public, interested observers, and property owners. Started in March 2016, the project cost $2.1 million and took seven months to complete. According District 1 Bridge Engineer Bill Koller, the 77-year old bridge is one of only two steel-rib tied-arch bridges in Pennsylvania. The second bridge is located about 15 miles upstream on South Franklin Street in Titusville, Crawford County. The District 1 Bridge Unit completed the design and drawings for the project, which included reinforcing the bottom tie chords of the bridge, eliminating the end floor beams, and painting. Work was also done on the surrounding roads, sidewalks, traffic signals, pavement markings, and landscape. Once the bridge preservation was complete, two regional development groups, the Oil City Main Street Program and the Oil Region Alliance, installed lights on the structure to further highlight its architectural details and illuminate its importance as gateway into downtown Oil City. The lights, which can shine in alternating colors, were turned on during a formal evening ceremony held in August.